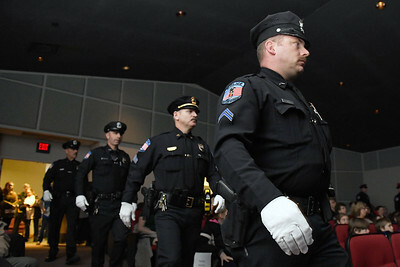 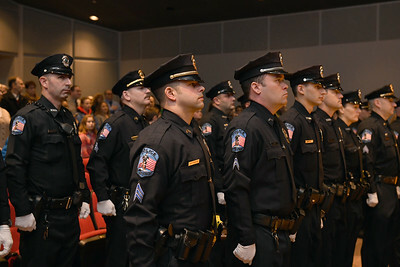 Corporal Andrew Plemmons, right, walks in with other officers at the start of the Paige Prouty sings the National Anthem during the 5th annual Rutland City Police Department Awards Ceremony Thursday morning at the College of St. Joseph. 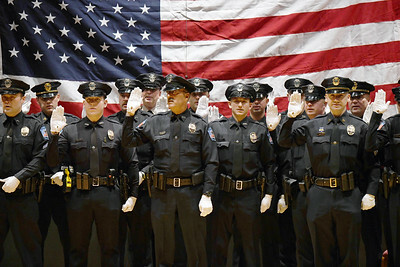 Sergeant Charles G. Whitehead stands at attention before the National Anthem at the 5th annual Rutland City Police Department Awards Ceremony Thursday morning at the College of St. Joseph. 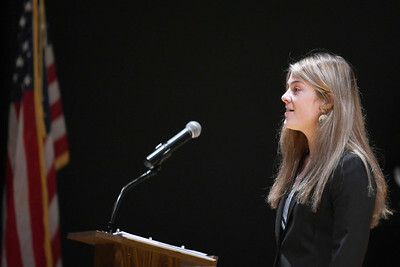 Paige Prouty sings the National Anthem during the 5th annual Rutland City Police Department Awards Ceremony Thursday morning at the College of St. Joseph. 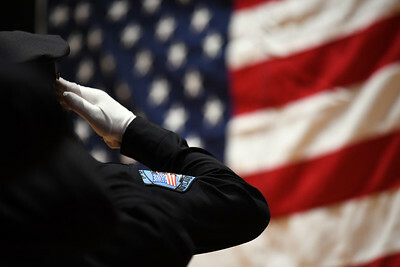 A member of the Rutland City Police Department salutes the flag during the National Anthem during the 5th annual Rutland City Police Department Awards Ceremony Thursday morning at the College of St. Joseph. 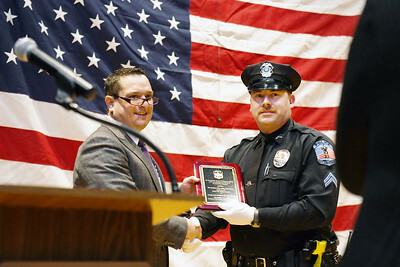 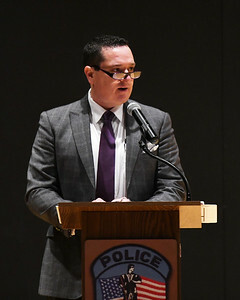 Police Comissioner Sean Sargeant speaks during the 5th annual Rutland City Police Department's award ceremony Thursday morning at the College of St. Joseph. 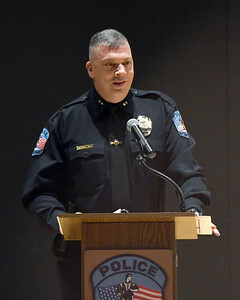 Brian Kilcullen, Rutland City Police Chief, speaks during the 5th annual Rutland City Police Department Awards Ceremony Thursday morning at the College of St. Joseph. 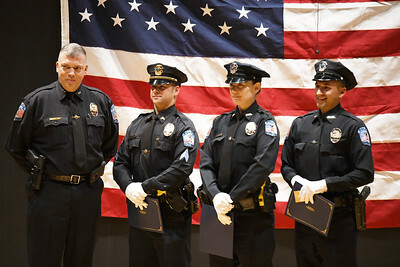 Rutland City Police Chief Brian Kilcullen, left, stands with Sergeant Charles Whitehead, Officer Jennifer Czachor, and Officer James Rajda after being presented wtih the “Excellent” category of the Recognition of Physical Fitness during 5th annual department award ceremony Thursday morning at the College of St. Joseph. 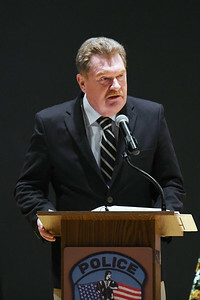 Keith Tallon, from the Department of Probation and Parole speaks during the 5th annual Rutland City Police Department Awards Ceremony Thursday morning at the College of St. Joseph. 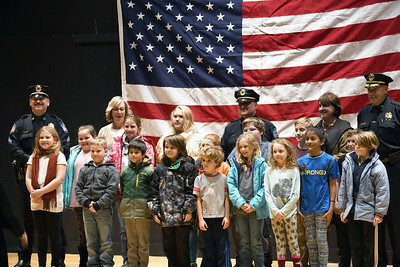 Children from Middletown Springs Elementary School stand with members of the Rutland City Police Department for a class photo following the department's 5th annual award ceremony Thursday morning at the College of St. Joseph.